The purpose of this tutorial is to help you take that difficult first step as quickly and easily as possible. To achieve that, we will create a Scala command-line application, and use it to introduce some language features and syntax. 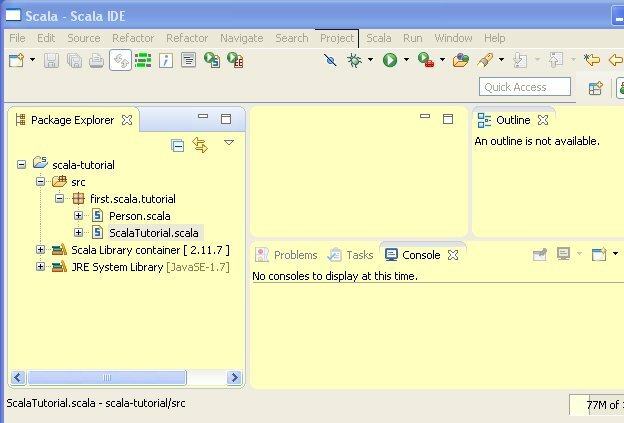 At the end of this tutorial you will be in a position to write useful Scala programs, and easily progress with your learning at your own pace afterwards. You need to have a Java Runtime Environment (JRE or JDK) version 6 or later installed on your machine. But I expect, being a Java programmer, you already have one (or know how to get it!) Just like Java, Scala code is compiled into Java byte code, and executed by the Java Virtual Machine (JVM). For Windows, the download is a ZIP archive. To install, extract the files and open the “eclipse” folder. Create a shortcut to eclipse.exe and place it on your desktop. Double-click the shortcut to start the IDE; accept the default workspace location (where project files are stored) or specify a different one of your choice. Do not worry if you are not familiar with Eclipse, step-by-step instructions are provided below. In the dialog, enter the project name e.g. scala-tutorial, accept all defaults and click on [Finish]. In the “Package Explorer” view, you should see your new project created. Right-click on the “src” folder, select New -→ Package. Type the name of the package e.g. first.scala.tutorial and click [Finish]. The new package should appear in the Package Explorer view. Now right-click on the first.scala.tutorial package and select New -→ Scala Object. Type the name of the object e.g. ScalaTutorial and click [Finish]. The new source file should appear in Package Explorer, and open in the editor area. The ScalaTutorial object we just created is a singleton object. We are going to define now the entry point of our application. For this, we need to define a main method with the appropriate signature inside our ScalaTutorial object. The only instruction inside the main method just prints the String “Hello from Scala” to the standard output. Do not worry about the syntax details, we will get to these in a minute. Let’s run the application first. Right-click ScalaTutorial.scala in Package Explorer, and select Run -→ Run As -→ Scala Application. You should see the string “Hello from Scala” printed out in the console view. Congratulations! You just wrote your first Scala program. As you know, in Java the entry point of a command-line application is the static void “main” method in a public class that takes an array of strings as parameter. In Scala, it is a “main” method in a singleton object that also takes an array of strings as parameter. There is no concept of static members in Scala classes; Scala uses singleton objects instead. In Scala, methods are defined with the “def” keyword. Note that there is no return type specified in the “main” method declaration. In Scala this is optional: the compiler works it out. The “main” method has return type “Unit”, which is the equivalent to a Java method with the return type “void”. The API documentation describes all the classes, objects and traits (interfaces) in the standard Scala library. Scala has two types of variables: vals and vars. A val is like a final variable in Java, and a var is like a non-final variable (i.e. can be reassigned). In Scala you do not need to specify the variable type, the compiler works it out. But don’t be fooled by that: Scala is a strongly typed language, just like Java. Unlike Java that uses primitive types and wrappers, all values in Scala are objects, including numerical values and functions. Therefore, all values are instances of a class. If you try to reassign the value of myval, because it is final, the compiler will complain. But you can freely reassign the value of myvar. The println calls show the class names of the variables. Run the application again, and check the output to the console window. Before we proceed, let’s introduce some terminology. Conventionally, a procedure is simply a function with a result type of Unit (void). If a function returns anything other than Unit, it is called, well, a function. If a function or procedure is a member of class, it is called a method. Select the “Arguments” tab, and type a few strings in the “Program arguments” field, e.g. one two three. Click [Apply] and then [Close]. The foreach method is implemented by all traversable Scala collections. It takes a procedure as parameter, and applies the procedure to each collection element. 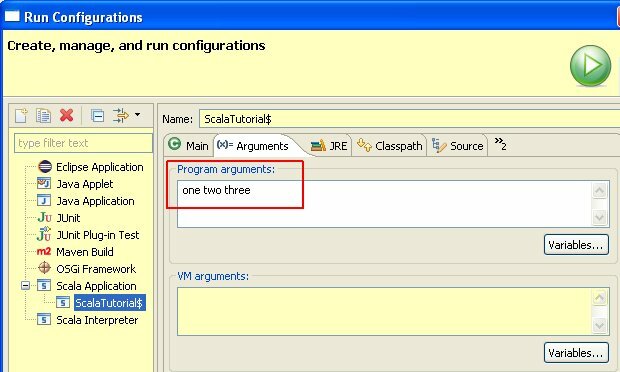 In this case, we are passing the println procedure to it; the result is that when you run the application now, you will see each argument that you have passed to the program printed to the console. Try it. In Scala functions/procedures/methods are values that can be passed around. This forms the basis of functional programming. Here, we are assigning a function literal to the variable “increment”. The syntax to construct a function literal is a list of named parameters and their types in parenthesis e.g. (x:Int), followed by a right arrow (or rocket) operator =>, followed by the body of the function e.g. x+1. The next statement passes the value 10 to our increment function variable which is passed to the println procedure. If you run the application now, this statement prints the value 11 (10+1) to the console, as you would expect. To conclude this introduction, we are going to write a Scala class. On the IDE, right-click the package first.scala.tutorial (or whatever you have called it) and select New -> Scala Class. In the dialogue, type the name of the class, Person, and click on [Finish]. A new source file named Person.scala appears in Package Explorer, and should be opened in the Editor window with an empty class declaration. "I am " + age + " years old"
We have also defined an additional no parameter constructor in the body of the class, using the keyword “this” (it instantiates a Person with a default age of zero). The “this” keyword is used to define constructors inside the body of a class. Then, we define a method “birthday” that, when called, increments the age of the Person by one. Notice the syntax. The method takes no parameters, and returns Unit (void). Finally, we override the toString method, defined in the Scala top-level class “Any”, so that it prints the age of the Person in a verbose manner. Again notice the syntax: overridden methods are declared with the keyword “override”. Here we instantiate two Person objects. The first instance, “adult”, uses the single parameter constructor. The second, “baby”, is instantiated using the no parameters constructor. On each instance we call the “birthday” method twice, and invoke the overridden version of toString. If we run the program, what would you expect to be printed to the console? Give it a try, and check that the output is what you expected to see. There are many features of Scala that we have not covered in this quick introduction: traits, assertions, collections, pattern matching, extractors, annotations, actors… but you should be equipped now to continue the exploration on your own. That was our objective: to get you started. You can explore each feature by adding code to the simple command-line application that we have built and test it. I also recommend the excellent book Programming in Scala by Martin Oderski, who is the creator of the language. It is a clear and complete Scala reference, and an excellent programming text. I hope you have found this tutorial to be useful, and I would appreciate your comments. Thank you for reading, and good luck with your learning! Thanks. Intro is just the way it should be, basic confidence building measure. Nice Introduction. Quite Useful. Thanks!